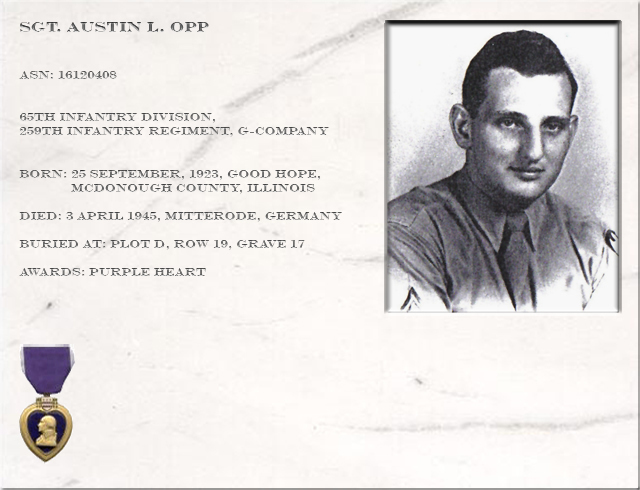 Austin Luther Opp was born on September 25, 1923 in Good Hope, McDonough County, Illinois. His father Wayne and mother Leona later moved to a farm in Bushnell, McDonough County. Austin has two brothers, Ernest and Rollo and a sister named Esther. Ernest served in the navy during the second world war. In 1941 Austin graduated from high school and went to the university of Illinois to study medicine, as he would like to become a doctor. War ended altered these plans and in 1943 he joined the Airforce, where he received some flight training. But after D-day many Airforce cadets were transferred to the Army in preparation for the campaigns against Nazi-Germany. 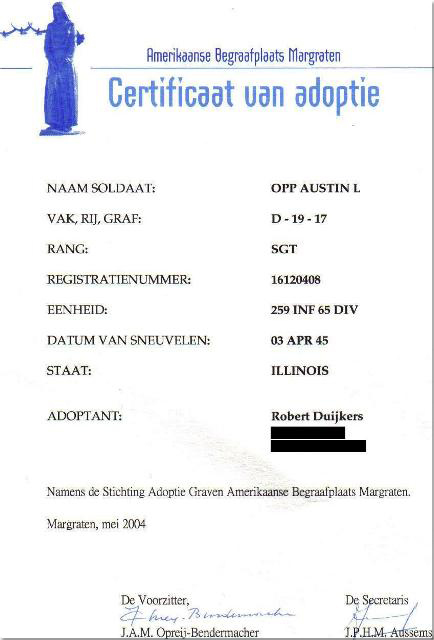 This is how Austin eventually was assigned to the 65th Infantry Division. Soon he would become a sergeant, in charge of a mortar squad. 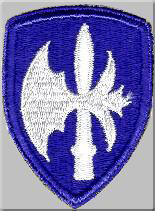 "The Halbert", the patch of the 65th infantry division. It represents a medieval battleaxe which can be used for hard strikes and pushes. On august 16, 1943 the 65th Infantry Division, named Battleaxe was activated in Camp Shelby, MS. General Major Stanley Reinhart was the commanding officer of the division. The men of the 65th traveled to different bases with the XV and IX Corps, training and building up for the upcoming battles that would take place across Europe. The 65th Infantry Division trained almost continuously until December 31, 1944 where they staged at Camp Shanks, NY, preparing to embark for France. the division was to be the first to be de-activated. In one of his letters, Rollo Opp, told me the following, touching story. In early October 1944 (Ausin was 21 years old, Rollo nine) Austin was brought to the trainstation in the neighbouring town. Austin was reporting back before being shipped to Europe. Austin took little time to tell Rollo he was sorry he would have to miss his tenth birthday. (October 14) They could not know then, that this was the last time they would see eachother. Rollo visited Austin's grave once in 1958, when he was serving the US army in Germany. 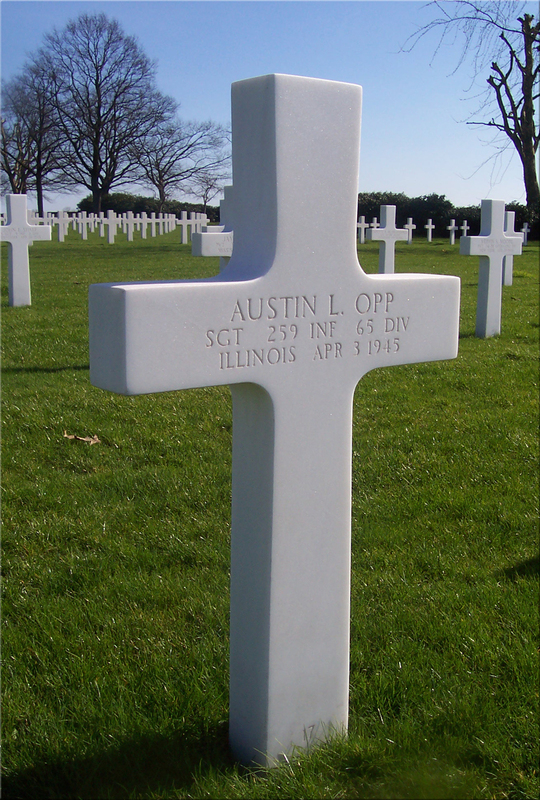 Austin died on April 3, 1945 in vicinity of Mitterode / Rohrda. Mitterode is now situated in the municipality of Sontra in the district of Nordhessen in the heart of Germany. April 2nd his unit stopped at the north side of Sontra. Here they stayed for the night, waiting for the morning of the 3rd of April. I already learned from Austin's brother Ernest that Austin was ambushed while being on night guard duty. Gordon Lindberg was also served with the same company. He knew Austin as a nice guy, but he did not have much contact with him. He confirmes Ernest's story: "in the morning (April 3) we found Austin in his foxhole, he was killed bij a German grenade". Austin's file says the cause of death is a gunshot wound to the chest, this could have been caused by a piece of shrapnell, being mistaken for a bullit. The date of death seemed to be unclear at first. Often it says: "unk. (estimated to be april 3)", this is logical regarding Austin was not found before morning. Afterwards the "unk. (estimated to be" part was corrected, leaving the "april 3" part. That Austin was not found untill the morning probably means that there is probably nobody who excactly knows what happened that night. 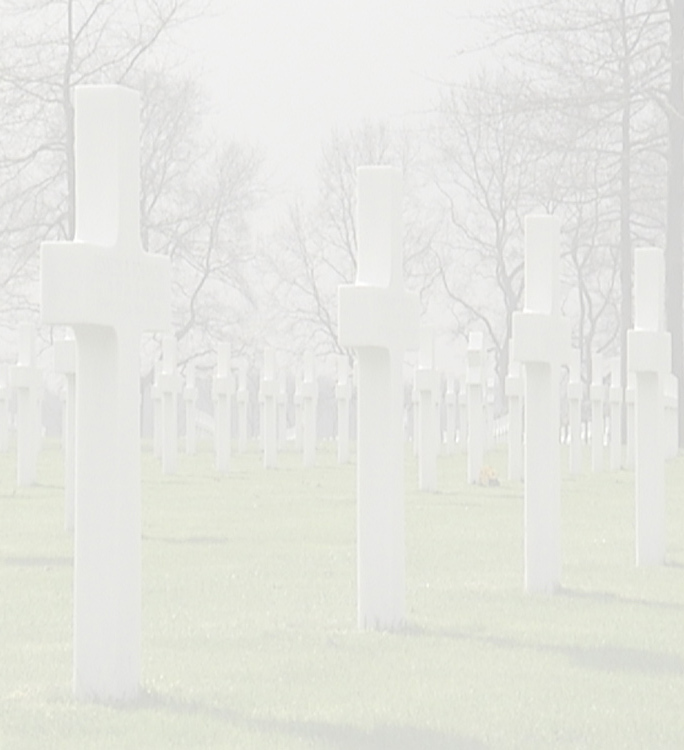 He probably died alone, in the heart of Germany, far away from home. I am still doing research about Austin (will probably never stop). I am now trying to obtain the German combat reports regarding April 3, 1945, pertaining to the vicinity of Sontra.